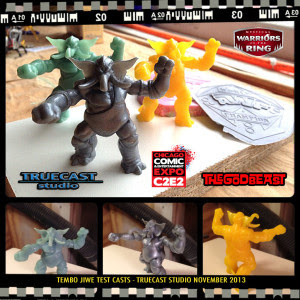 Ironhaus Productions OZ: FUTURE - 'Mystical Warriors Of The Ring' 3 new colours + Tembo Jiwe reveal! 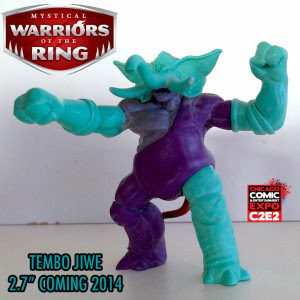 FUTURE - 'Mystical Warriors Of The Ring' 3 new colours + Tembo Jiwe reveal! After the successful initial release of Mystical Warriors Of The Ring (MWOTR) PVC sets in Candy Apple Red & Flesh, Fantastic Plastic Toys are steamrolling ahead with their second wave of colours about to hit online stores soon! Up for grabs will be the the 3 returning wave 1 figures (Kayin Kungaa, Widowmaker & Sheldon Sabre) in 3 new colours, sold in 3-packs as usual. The Pearlescent Black colour is MWOTR's first Retailer Exclusive, Jay's CD & Hobby and currently there has been no price pint set as far as I'm aware of but I think it's safe to say we can expect it to be around the $10 mark also. Both the Pearlescent Blue & G.I.T.D figures will be available from TrueCast Studio Store so keep your eyes peeled for their release there very soon! You can read more about this on the MWOTR blog, but remember I'll also be making regular updates regarding any MWOTR developments here on my blog too. Next exciting bit of news form MWOTR is their new giant character reveal, Tembo Jiwe the Elephant! Weighing in at 2.7" of PVC goodness, this will be MWOTR's third giant character including previous characters Goliath (was available in Resin) Kayin Kungaa (still available in PVC). 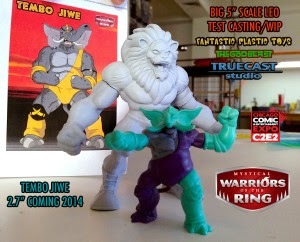 Tembo Jiwe will be making his exclusive debut at C2e2 2014 in (I believe, judging by these pics) Green, Yellow & Pearlescent Silver! No word on how much they will cost yet but I'll find out and post about it. On another note, If anyone is planning on going to C2e2 and doesn't mind, please let me know as I'd love to get my hands on him. (I'd be happy to cover the cost of course). You can read more about Tembo Jiwe at the MWOTR blog. 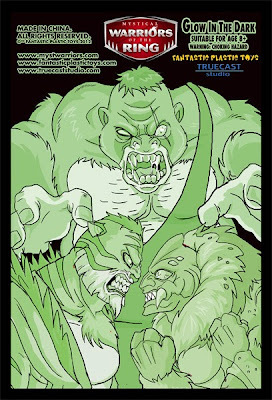 C2E2 is right here in Chicago so I should be able to help you out. That's where I picked up my initial set with the ring back in April. I'm sure I'll be going again this year. PRESENT - OMFG Series 3 mini review!